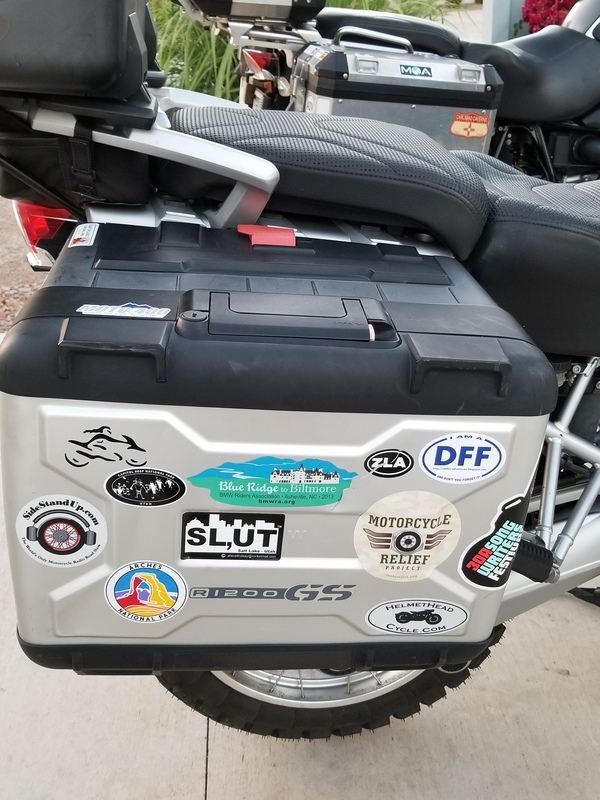 We interrupt the long silence in reporting our Southwest trip to report a really fun meeting with another Moto Blogger that happened after only a week’s notice! Let me back up. I’ve been blogging for nearly four years (really?) and have virtually met so many lovely people, both Moto bloggers, and regular people,😊 but have only met two of them IRL (In Real Life). I was fortunate to meet NancyTex who blogs at My Year of Sweat a few years ago when she took a job with a company with HQ in Atlanta. Then in 2015 at a BMW Motorcycle Rally, I was pleased to meet Kelly, a fellow moto-blogger at Mindful Wandering, and bonus, she and her hub are also motorcycling RVers, a club we had just joined as well! Both relationships expanded to Facebook, Instagram, and Twitter, but still virtual due to large geographic differences. And then there are the times we’ve intended to meet, but it didn’t work out, like with Kathy at Toadmama. Despite having very similar likes, riding styles, and love of travel, we have just not yet been able to sync schedules to meet and ride together…YET! Anyway, when we were planning this SW trip back in February, Toadmama hosted a month long blog challenge, and in the comments on various posts, several moto-bloggers discussed meeting at the BMW National Motorcycle rally in Salt Lake City in July, including Richard from Richard’s Page, Ry at Two Wheels to There, and others. However, in researching SLC in July we discovered it would be really HOT 😈 and since we wanted to visit many National Parks and monuments, and hike, we decided to do our SW trip earlier, so that nixed the BMW rally idea. Hmmm. Fast forward to about a week ago. We were in Torrey, visiting Capitol Reef NP and riding fabulous UT Hwy 12. Our Utah travels were only going to take us as far north as Moab, but I thought “what the heck”, I will reach out to Ry who lives in Salt Lake City, and see if a meeting would be feasible. 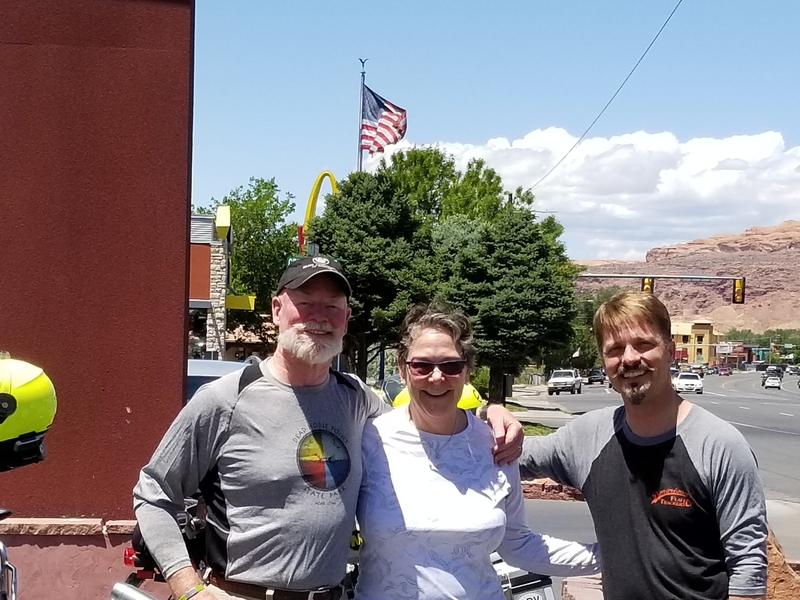 And lo and behold, he planned a long weekend motorcycle trip including a lunch visit with us in Moab!!! 😎 Yay! 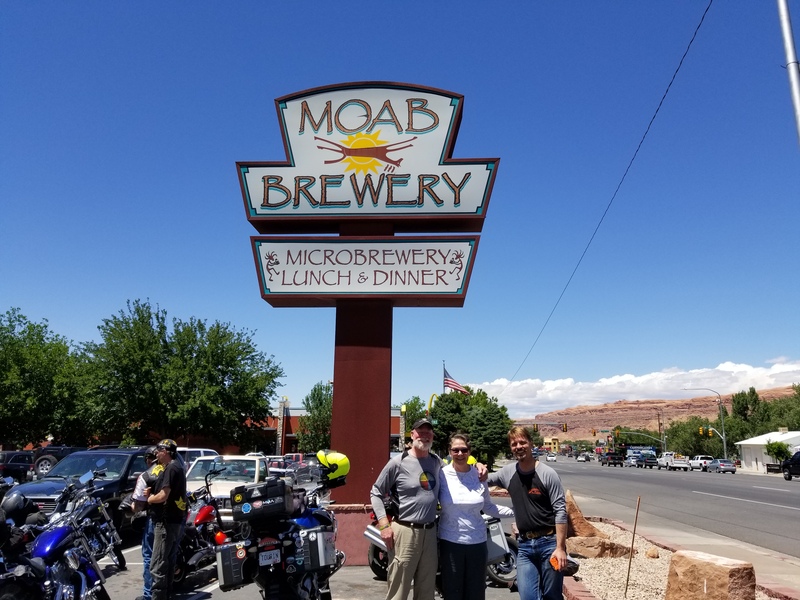 At the appointed day and time, the hubs and I pulled up to the Moab Brewery to find Ry waiting, and with a parking spot large enough for three bikes! Once seated, the conversation flowed as smoothly as the fine Utah brews. Oh, for safety’s sake, we only had one…each, lol, we were riding, after all. We discussed bikes, of course, trips, Utah history, backgrounds, and a bit of philosophy! I keep saying that the people we meet are the cherry on the top of the joy of travel, and meeting Ry confirmed that! We know we will meet again, so it was “so long for now” as we went off on our next adventures. Safe travels, my friend! How fun!! I have met a few scrapbookers in real life and it was really neat! I’m so glad you all got the chance to meet up! I’m not sure why the MOA seems to find the warmest venues for their rallies. Hopefully SLC will be cooler than the Bloomsburg, PA, rally. The heat and humidity made that one miserable. Richard, I agree, and always in the heat of July! Bloomsburg was a killer…we probably saw each other there 😎 Can’t believe you leave Alaska for the heat! And hey, we will be in Alaska for a cruise/land tour in September! Which city are you near? Ah, we’re going into Anchorage and out of Vancouver. Maybe another time on the road! Fun! Blogger meet-ups are always great. I feel privileged every time we get to meet another blogger in person. If your travels take you near Oregon, let us know. Yes, Brandy, so fun! We are hoping for NW coast next year and would love to meet you! Such a great story, its great to see our writings turn into friendships. That’s what what its all about. I’m jealous – I want to meet you!! Can’t you ride your bike to Scotland?! Sounds like so much fun – I’ve met just a couple of online friends, but it’s always been fun! Yes that trip turned out to be a bit too bonkers, but I was so fascinated by the area it definitely won’t be my last visit!